HiR Information Report: Epoch Fail! I recently introduced AsmodianX to the somewhat dated "FAIL!" Internet meme. That is, illustrations where something has gone wrong, captioned with the word "FAIL!" This can be a boat full of cargo that's about to fall overboard or a skateboarder doing a face plant. Things of that nature. Of course, this evolved, and certain tragic situations (such as an entire truckload of beer bottles shattered on the highway) came to be labeled "Epic Fail!" 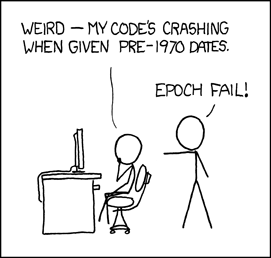 Epoch Fail is a terribly funny play on words with Epic Fail, obviously. This refers to Epoch time. The current POSIX Epoch started midnight, Jan 1, 1970 and will come to an end (run out of the 32-bit space) sometime in 2038.